This module is focused on short description of meaning the ICT in modern education processes and presents some of tools enhancing creativity of students. The reader will read and learn about role and impact of ICT on changes of the education process in way to be more interesting for the young generation; about the tools that can help enhance creativity and critical thinking of students. and new learning and thinking critically about ideas, actions and outcomes. All of above present most of core indicators of creative thinking. And all of these activities could be supported by ICT . 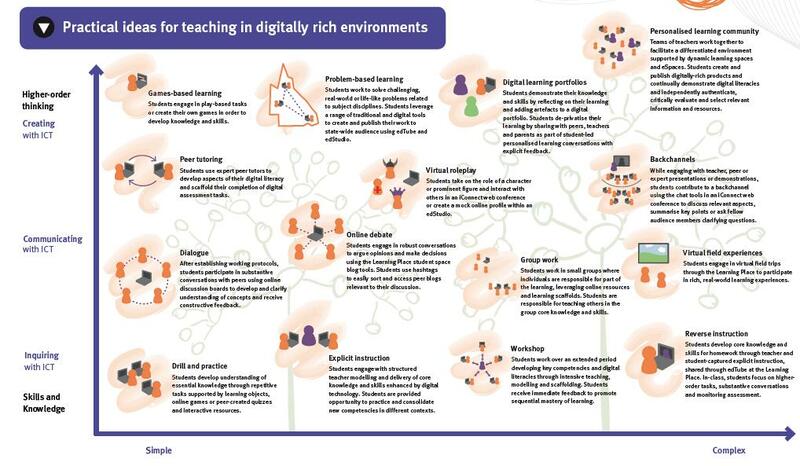 Based on the  could be stated that due to pressure from the EU the majority of European educational institutions are equipped with traditional ICT (PCs, interactive whiteboards and Internet connection). Continuously increasing number of them also invests to other equipment like laptops, electronic microscopes, web-cams, etc. Various European schools use Moodle, wikis, blogs and also have their own homepage. Online platforms could provide parents access to learning materials and tasks, which would help them to understand new learning approaches and support their children at home with their schoolwork. However, the main shortage of informatization of education process lies on teacher ICT capability. A good number of them use ICT just as an extension or replacement of traditional tools (interactive whiteboard as replacement for blackboard, PPT presentations as replacement for printed books) and Internet is used mostly for accessing new information for the teacher during his preparation for lessons. As crucial factor for capability using the appropriate ICT tool seems to be teaching students to use ICT before applying it to specific subject and problem solution. ICT tools like interactive whiteboards, video projection units, and microscopes connected to computers, spreadsheets prepared to capture and model data, CD-ROMs, presentations with video could be use as just supportive technological tool but also tools for enhancing students’ motivation, involvement and creativity within education process. It depends on way how it is used by teacher. Unfortunately, there is no general guidance on how to actually develop creativity in practice . The influence of rapid changes in the field of ICT is also projected to the education. With inviting the smart technologies to out-school live, they are more commonly used also for education purposes. Students and teachers can interact (learn, discover, collaborate, create and share) in a safe, fun, engaging and supportive environment. Figure 2.1.1 presents a wide range of ideas how to use ICT in education. Blogs develops creative thinking and writing skills of students, because they can post whatever they want and comment upon or share each other’s material, openly write on topics that intrigue them and give vent to their ideas without having to worry about grading or grammatical errors. Blogging makes students feel responsible for their own learning and they are encouraged to incorporate creativity in their learning through them, which they could not do before. Well known and used are Edublogs, Blogger, WordPress. Cartoon and Comic Strip Tools are great tools for education, because students love cartoons and comics. Using them in teaching, students automatically get engaged more than ever. Creation their own comic strips or cartoon animations give them a chance to let loose their creative powers and delve into the world of creativity without any hindrance. One of websites with such resources is ‘Cartoons for the Classroom’ website. Mind-Mapping and Brainstorming tools boost students’ creativity and provide them with different ways to interconnect their thoughts. Brainstorming on topics is a great collaborative way in today’s teaching practices, which encourages students to think out of the box and creatively. Using ICT students can use a set of easy and free tools to make fantastic mind-maps and visual graphs to illustrate a topic or a concept. Applications like Online Brainstorming, Mind Mapping software, Whiteboards for distributed collaboration, SpiderScribe, Wise Mapping, ChartTool, Creately and more help to facilitate the idea generation (ideation) and allow a group to participate in an ideation session without being physically together. More complex tools – Platforms for handling the creativity process and Crowdsourcing platforms – help to handle the creativity process itself. Infographics represent data in a colourful and catchy way. By using free tools for infographics, students can create awesome graphs, which make the interpretation of information easier and quicker. They can employ their creativity and imagination to create an infographic about a topic, concept or anything they want. They can share these infographics and also embed them into their classroom blog. Some free tools for creating infographics are Wordle, Tableau, Inkspace, and more. Video and Audio tools let the students to create their own videos/audio output and share them with their class on the class blog or school website. Some video-making tools for students and teachers are Jing, Camstudio, Screenr, etc. Some audio-recording tools are Vocaro, Audio Pal, Record MP3 and more. Digital storytelling tools presents a powerful way to communicate with others. It improves the creative skills of students and helps them explore the meaning of their own work and experience. Students can create their own digital stories with many available free tools, namely, Story Bird, PicLits, Slidestory and more. In present there are available also application for their mobile phones, using which students can create their story anytime and anywhere. Games are one of the best ways of promoting co-operation and creativity. Educational games keep students engaged with their study, ignite the interactive and imaginative element in their thinking and mould it towards creativity. Some educational games freely available online are Capital Penguin, Grammar Gorillas, FunBrain.com and more. Building a culture of open innovation requires rewarded teamwork and organizational changes that foster internal and external collaboration. Global innovation networks are forming. And it is key role of education to educate people able to collaborate and share their ideas with others without fear of failure.